Hi, I have not been playing my concertinas much these last few months and would like to sell this model in order to re-invest - you know how it goes :-). I bought this instrument off of ebay a few years back as an upgrade to the entry level 30 key instruments, which it was. 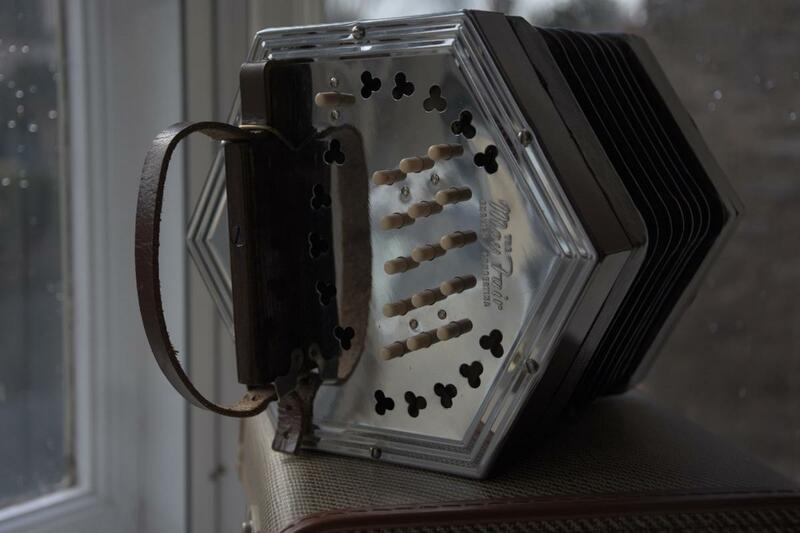 If I recall from the seller, it was originally purchased and played by a blind street musician in Canada and brought back to Scotland where it sat in a cupboard for many years. Hence it is probably in as good as a condition you can get for an instrument getting on for 60 years old. I like the fact it is as old as I am, hmm but in some respects seems to have fared better :-) Anyway, given this instrument participated in a few ToTMs on this forum I thought I would offer it here first. Comes with a case. I am in Herefordshire in the UK. £425 . Thanks. Hello, Seethe post from log haired David, you may have found a buyer! Does it need any work? I have to convince "she who must be obeyed" which could be difficult. My wish for a new instrument doesn't always coincide with her budget decisions - smile. Hi David - no work required - I am happy to let you have it on a try/return basis, if you were happy to pay the both way postage should you not be happy? Please IM me.